.NET for AmiBroker is a 3rd party software package that provides full .NET programmability to AmiBroker. .NET for AmiBroker covers all programmable features of AmiBroker: plug-in interfaces, built-in AFL functions and objects, OLE interface, IBController can be accessed and used from .NET code while using any .NET language. Indicators, filters, scanners, explorations, custom backtester modules, automated and real time trading systems, optimizer and data source plug-ins, OLE automation programs that drive custom optimization and scanner processes or data loading, etc. can be developed in C#, VB.NET, VC.NET, F#, or any .NET language of choice. AFL plug-in development that once used to challenge even experienced C/C++ developers can now be done in any .NET language very easily and fast. .NET plug-ins can extend or completely replace AFL scripts. Include files can be easily converted to AFL plug-in. Indicators, scanners, explorations, backtester modules, real time trading modules, etc. can be created in pure .NET or in a mix of AFL and .NET. .NET code can simply access all the built-in AFL methods and objects of the backtester interface. Optimizer and data source plug-ins can be developed in any .NET language as well. 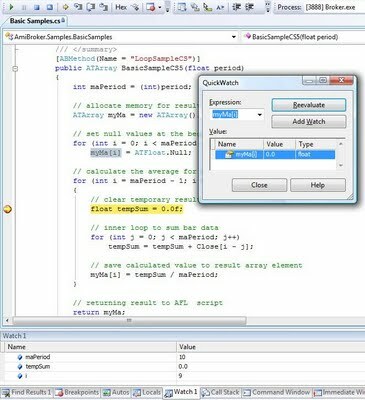 Using these AmiBroker interfaces from .NET for AmiBroker is simpler then the C/C++ interface. They still provide the full functionality of the original interface. AmiBroker’s OLE automation interface is also accessible from .NET code. A full blown object model equivalent of the original object model makes it possible to manage AmiBroker database, load custom quote data, to run scanners, explorations, optimizers directly from .NET code. 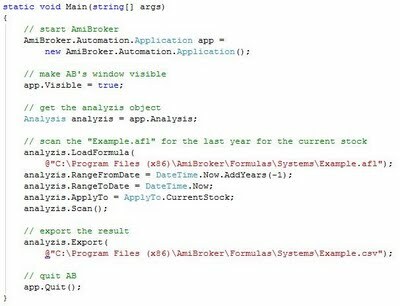 .NET for AmiBroker provides easy integration of AFL indicators, trading logic in object oriented .NET code and AmiBroker Auto-Trading interface for Interactive Brokers. The managed IBController interface and the .NET plug-ins together provide new, easier, more reliable and managable ways to create real time trading systems. Visual Studio 2008 or Visual Studio 2010 for .NET for AmiBroker – Developer Edition. Visual Studio 2008 Express or Visual Studio 2010 Express for .NET for AmiBroker – Standard Edition. This setup does not allow step by step plug-in debugging. .NET for AmiBroker – Developer Edition and .NET for AmiBroker – Standard Edition have a 30 days trial period. i want to create application, using this application i want to get alerts from amibroker. also tell me how to add COM object and how to use the COM objects. Please give me needful answer. i’ve created dll plugin using .netforab dev edition.how to call plugin in amibroker. i tried many times but i cant. and how to write script for call the dll in amibroker. i expect your reply. you need to call the function along with the parameters which you hardcoded in the dll. I have AmiBroker installed on my PC. I have some strategies to feed in to it. these strategies in to my AmiBroker. Just wanted to share this new app for Amibroker alerts. You just need to install desktop client on your computer and mobile app on you mobile. It picks amibroker signals and sends directly to your mobile…..i tried it and works fine…..
Hi sir.. I would like to know the conversion of amibroker afl file into dll??.. Please help me out ASAP. how to convert afl to dll with step by step. what is the syntax for alertif function in c# 3.0 version. I am getting syntax error. AFTools.AlertIf(cond,” “,”str”,0,1,1); saying best overloaded method has some invalid arguments. plz help me. I want to learn codes to lock afl to dll along with licence manager ??? Any abody pl help me ??? I have done ranking for stock, now want to automatically change the ticker to get signal from top ranked symbols. how to automatically change ticker (not by setforiegn(ticker) -- it generates signals to orignal ticker only).